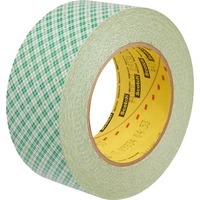 This double sided tape is made with natural rubber and utilizes a densified Kraft green plaid paper carrier for increased strength and dimensional stability. It offers excellent high initial adhesion and good holding power to a wide variety of materials. Use tape for indoor and room temperature applications.